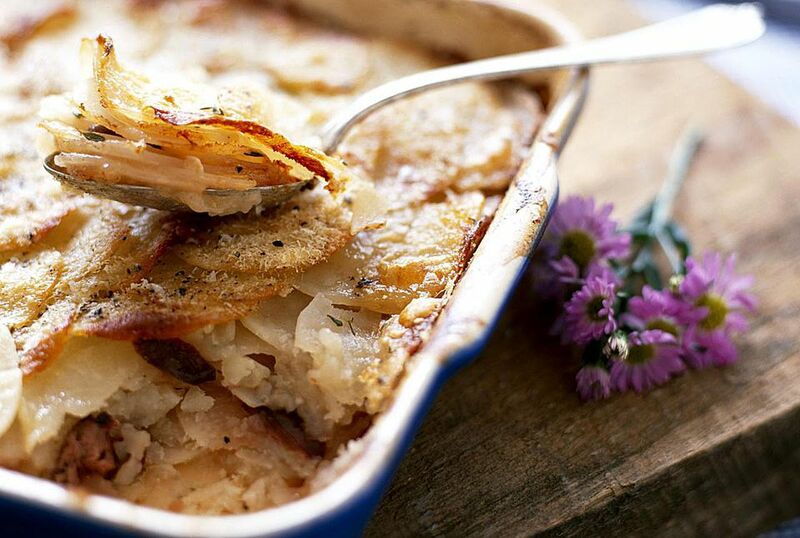 Scalloped potatoes are baked with cheese, milk, butter, and chopped onion, along with seasonings and flour. Place half the potatoes in a greased baking dish. Sprinkle with half the salt, pepper, flour, onion, and cheese. Dot with bits of butter. Repeat layer then add milk to cover potatoes. Cover with foil or lid and bake at 375° for 45 to 55 minutes, or until tender. Take the lid off near the end of cooking to brown, or put under a broiler for a few minutes.